Interesting Facts aka the Fifth Ave Theatre. It was converted to the Fifth Avenue Opera House by the Christy Minstrels. After the Minstrels left it was leased to a company that performed burlesques & light comedies. 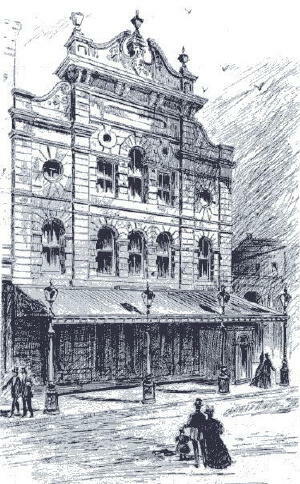 In 1868, financier James Fisk bought the theatre, redecorated it to his own taste, and named John Brougham as head of theatre. It was briefly known as Brougham's Theatre but was not successful. It was later taken over by Augustin Daly in 1869 and he ran it until it burned down in 1873. During that time it was the most fashionable theatre in New York. It was rebuilt in 1877 when it was taken over by Steele MacKaye in 1879. Steele MacKaye renamed it the Madison Square Theatre where he redecorated it and incorporated his inventions. MacKaye innovations included air conditioning, accelerated scene changes, lighting effects and the folding auditorium chair. From 1885 to 1891 it was managed by A.M.Palmer. In 1891 it became Hoyt's Theatre a showcase for the plays of Charles Hoyt, whose satiric farces on American life and very popular during the 1890's. Joseph Haworth appeared at Hoyt’s Theater in Sue on September 15, 1896. It was written by Bret Harte, a famous American writer of short stories such as "The Outcasts of Poker Flat." His co-star was Annie Russell who was called the "Duse of the American Stage." Also in the cast was Theodore Roberts who became a great star in early American cinema.